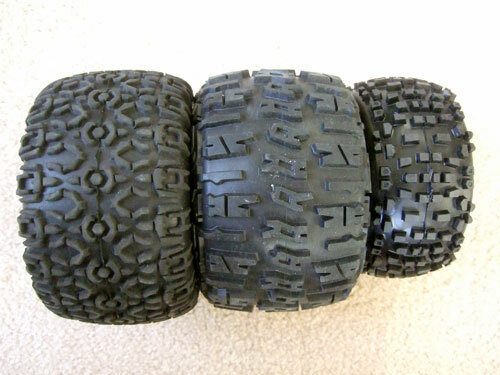 Since I really like the trenchers on the Baja 5T I wanted to give the Proline Trencher X tires (1184-00) a try. 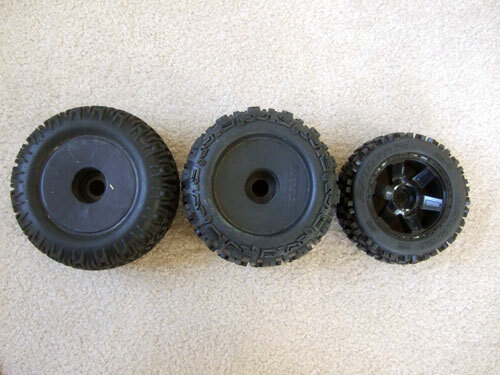 I could have gotten the trencher X pre mounted on Desperado 17mm hex wheels but the will cause me 2 problems. 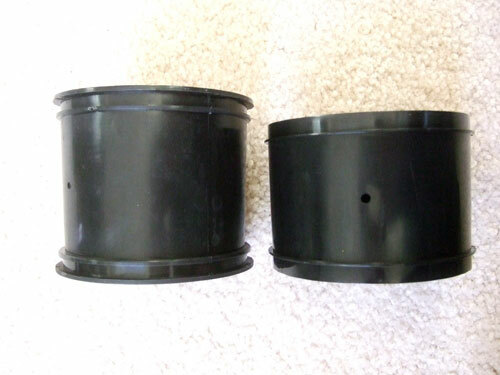 First I am using 23mm hex and I think is pretty much bullet proof so I do not want to switch back to 17mm hex. 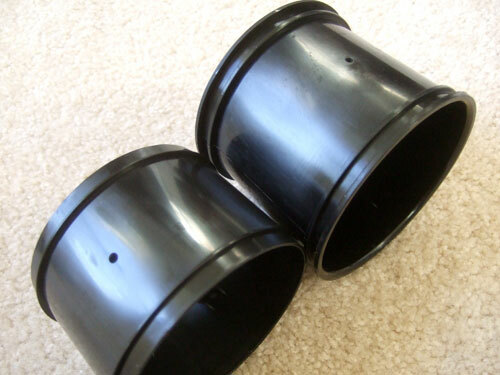 Next is that premounted wheels are NOT tapped in the inside. Meaning I usually duct tape the inside the tires to help control the ballooning of the tires. At low speeds it would not make a big difference. But with my brushless powered cars, when it hits about 40mph you can see the tires expand like a balloon and destroy the tires and foam. Plus the handling will suffer a lot too. 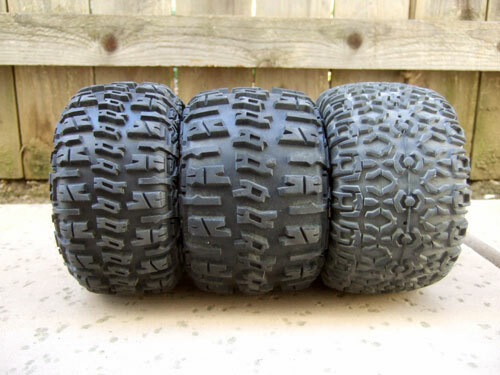 Please note that these tires will not fit on any 40 series wheels with out modification because the tires have traxxas style beads. 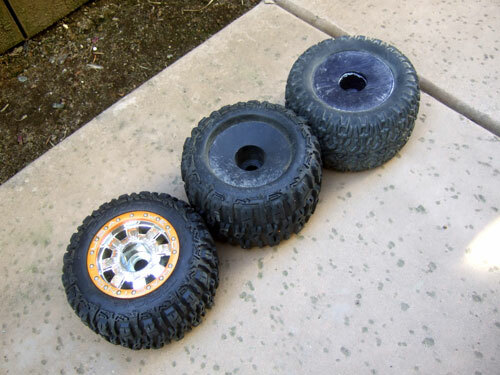 To make these tires fit on the wheels I had to trim the inner out outer edges of the wheel to remove the lip that standard 40 series wheels have. 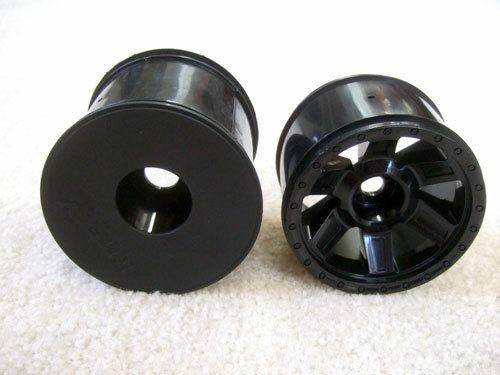 Below are 2 different wheels, to the right is a 40 series 1 inch offset 23mm wheels, on the left is a Desperado 3.8" (Traxxas Style Bead) Black 1/2 Offset 17mm Wheels. Can you see the difference between the wheels, other than the width? 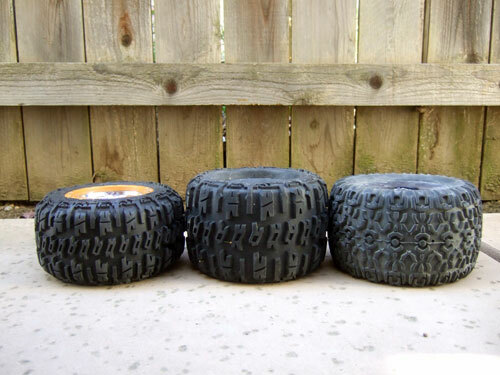 The 40 series on the right has a lip on the edge of the wheels. To my surprise, the Trencher X weights less than the Losi ATX. 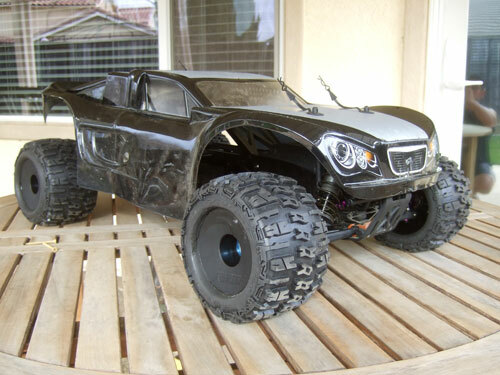 As for performance, the trencher x has the best overall traction in all conditions but I think I will use the Losi ATX for the streets because it has a harder compound and would last longer. The badland is in the pictures only for comparison and has not been glued yet. So I do not have anything to say about it other than I do not plan to use it on my savage becauseI bought it for my e-revo. 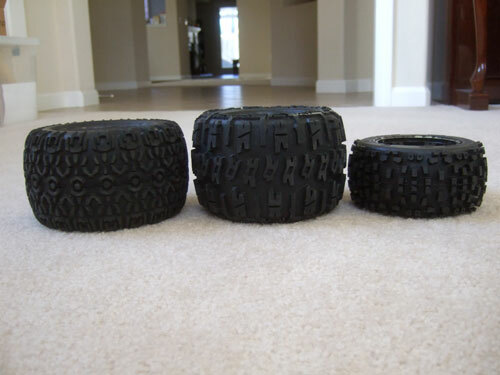 As for handling performance the narrower and lighter tires usually do the best.